No. 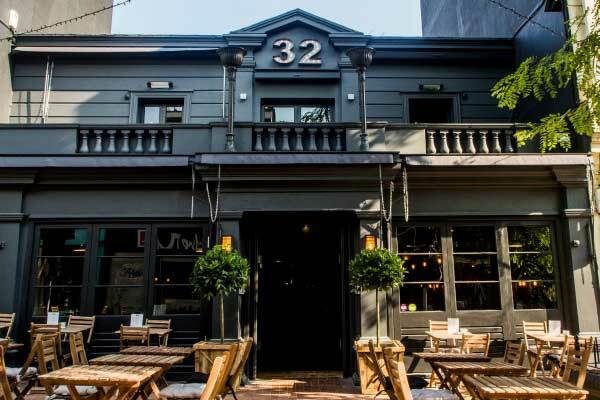 32 Duke Street is a restaurant, bar and late night club venue in the heart of The Lanes that serves a delicious variety of food. It’s quite a large venue with two floors and three bars, and has been decorated in a stylish yet comfortable way. It doesn’t feel like it’s used as a night club when you visit in the day. There’s plenty of seating outside the front but the highlight is the amazing terrace on the first floor – a really great spot on a sunny afternoon. You feel like you’re on holiday sitting up there and we were lucky we picked a sunny day to try out the brunch menu, plus the terrace was empty when we arrived so we had the pick of where to sit! 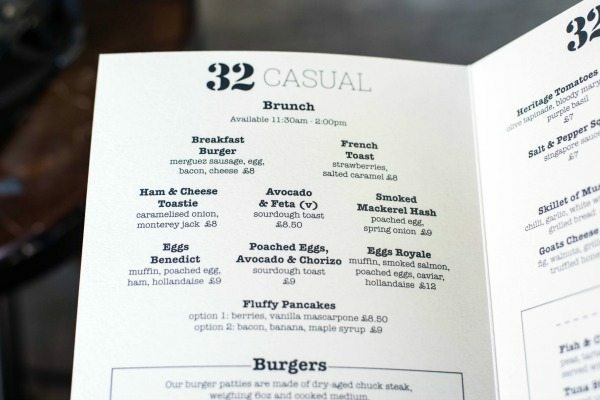 There was a great looking selection to choose from on the brunch section of their menu, which is served from 11.30am-2pm. It seems like a sophisticated take on a brunch, without a fry-up in sight. Instead there were dishes that included such ingredients as chorizo, sourdough toast, caviar, smoked mackerel – the list of mouthwatering ingredients goes on and on! To start, we ordered a couple of Bloody Mary’s and were asked how spicy we wanted them which I really liked because I do like a kick. 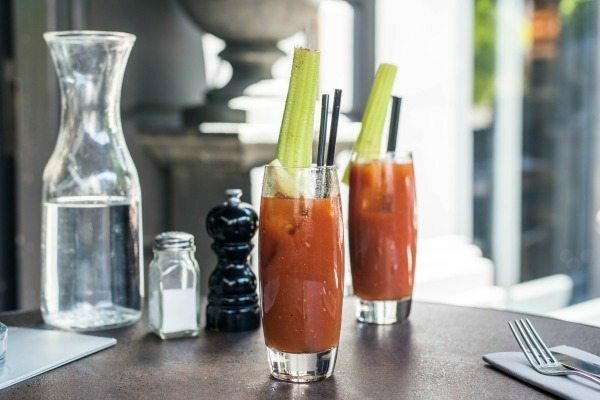 When they arrived they weren’t in skinny little cocktail glasses, they were full-sized glasses with a really delicious Bloody Mary, and there was a perfect amount of kick garnished with a stick of celery. We tried the Smoked Mackerel Hash with poached egg and spring onion (£9), it came served in a skillet which added some theatre to the presentation. The smokey tasting mackerel had the perfect saltiness which seasoned the rest of the dish very well. 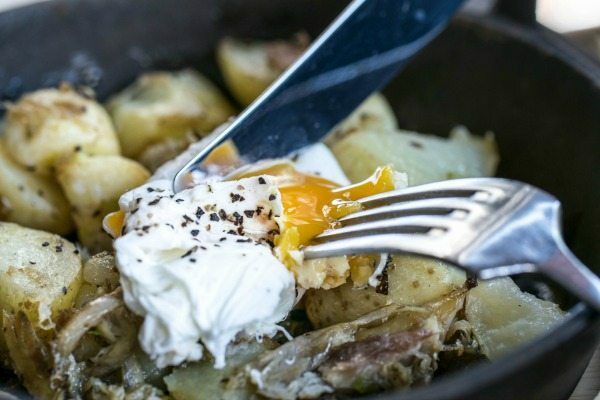 The fish had been stirred through some boiled then fried potatoes with spring onions and topped with a lovely runny poached egg. The flavour combinations of the creamy yolk and the smoked fish with crispy potatoes were delicious! 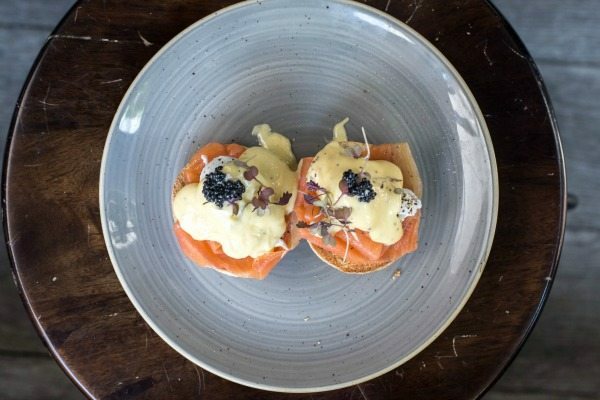 The other savoury dish we tried was the Eggs Royale (£12) which consisted of an English muffin cut in half, smoked salmon and a poached egg on top of each half with a generous dollop of a thick and rich hollandaise sauce, served with a little dish of caviar. I put a spoonful of the caviar on the top of each poached egg and it added a little texture and fish taste to the dish. The stark black of the fish eggs add a dramatic aesthetic to the dish and it had been garnished with some delicate foliage which made everything really come to life. Both the dishes we had tried so far were very generously proportioned. We tried the Fluffy Pancakes with bacon, banana and maple syrup (£9). There were two options to choose from with the pancakes, the other being berries and vanilla mascarpone (£8.50). 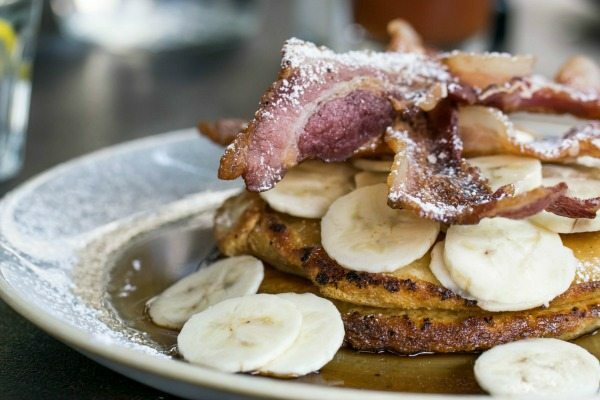 You get two American style super thick pancakes topped with sliced banana, crispy streaky bacon and lashings of maple syrup. The pancakes themselves were light in texture and soaked up all the lovely maple syrup. I really liked the flavour combination of the salty bacon with the sweet. I also really liked the varied textures in this dish, you have thick yet light pancakes with soft refreshing banana, crunchy bacon and a delicate dark syrup. The final dish we tried was French Toast with strawberries and salted caramel (£8). 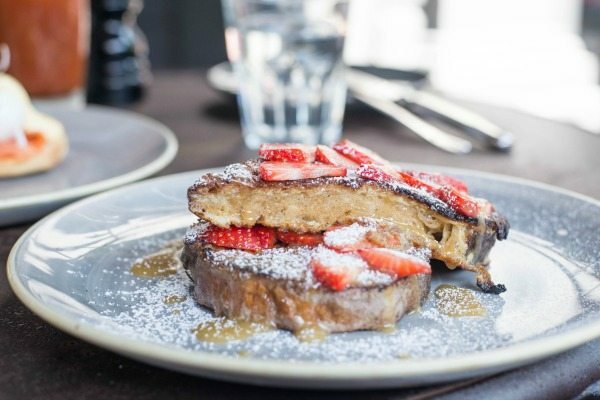 Two massive slices of sweet eggy bread with crispy edges, drenched in salted caramel and topped with bright, ripe strawberries. It was an indulgent, hearty meal that would satisfy any sweet tooth. By the end of our meal the terrace was buzzing with people, it was such a great place to have brunch with the chilled vibes, ambient house music and friendly staff. Even if it’s not sunny or you can’t get a seat on the terrace the inside is beautifully decorated with lots of space and vibey, comfy seating.